The event is sponsored by Girl Up, a club working to help women around the world. 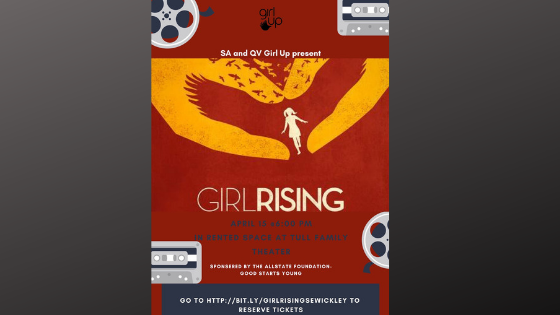 Quaker Valley and Sewickley Academy’s Girl Up clubs have teamed up to show ‘Girl Rising’ at the Tull Family Theater in Sewickley on April 15 at 6:00 p.m. All of the money from ticket sales will be donated to Girl Up, an international organization founded by the UN that is dedicated to securing equal opportunities for girls and empowering girls to rise up in their own communities. Girl Up believes that if girls are, “educated, healthy, safe, and counted, they transform their communities”. Girl Up has been a long-running club at SA; co-presidents Katie Hughes and Zoe Luther were proud to be elected to these leadership positions this year. The Girl Up branch at QV is new and was started last year by current president, Olivia Lehman. Vice president Kaelyn Morrow, and project manager Isabella Steinley are also working on this event. This is the first event where both schools have worked in conjunction to sponsor a fundraiser of this magnitude. Lehman says, “It’s an incredible opportunity to raise money and awareness to support girls internationally, but it is also important to be able to share this experience with our local community”. 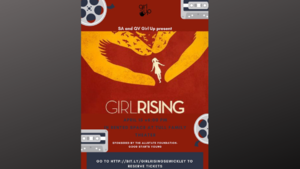 The Sewickley Girl Up team is excited to be showing “Girl Rising”, which showcases the “stories of nine girls from developing countries overcoming great obstacles to obtain an education and change their fates”. Hughes says, “We are so proud of what we have accomplished for this event and we hope the community will come to support it and hopefully be inspired by the film!” If you cannot attend, we also are accepting donations. You can buy tickets and donate by clicking here.